The British Royal Family has been wearing Welsh gold wedding rings dating back to 1923. Some of the Welsh gold used to make their wedding rings was taken from a nugget mined at the Clogau St. David’s Gold Mine in Snowdonia, North Wales. 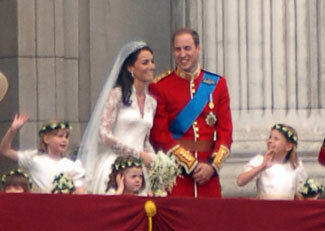 The tradition has continued to this day with the marriage of Prince William and The Duchess of Cambridge. The tradition was founded by Queen Elizabeth The Queen Mother (Lady Elizabeth in 1923) when she married King George VI (then Duke of York) on April 26th, 1923. Her Majesty’s wedding ring was fashioned from a nugget of Clogau Welsh gold owned, at the time, by a Mr. Bartholomew. He kept the gold that was left over from the making and it was used by W. J. L. Bertolle to make the wedding ring for Her Majesty The Queen when she married His royal Highness The Prince Philip, The Duke of Edinburgh (then Lieutenant Mountbatten) in 1947. Since then other members of the Royal Family have maintained the tradition of wearing Clogau Welsh gold wedding rings including Princess Margaret The Countess of Snowdon (1960), Princess Anne The Princess Royal (1973), Diana Princess of Wales (1981), Prince Charles (1981), and Their Royal Highnesses The Prince of Wales and The Duchess of Cornwall (2005). The tradition of the British Royal Family using Welsh gold wedding rings was carried into its 88th year during the most recent Royal wedding of the Duke and Duchess of Cambridge on 29th April, 2011.